Way back in 1994 Andrew Akers and his friend Dwane van der Sluis had this crazy idea that they wanted to walk on water. So, an idea was hatched to design some inflatable shoes, however they quickly realised that if they fell over in these shoes they would end up upside-down with their feet floating on the surface… not such a good idea. Back to the drawing board (AKA Andrew’s garage) They moved onto a double skinned plastic sphere that you could climb inside and roll over the surface water. They called it “The Orb” and took it to the beach to test out (along with Mum’s vacuum cleaner to inflate). But The Orb was hard to control in the surf and Andrew and Dwane were worried they’d float away to South America. After a few modifications and a name change, the Zorb was finally ready to be tested rolling down the hills of the Akers family farm near Kawerau and it worked! From humble beginnings the concept of downhill ball rolling was born. Next step; launch it to the world! What better place to unleash the quirky and bizarre concept to the public than Rotorua; tourist mecca of NZ. 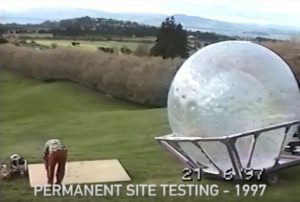 After briefly trialing a temporary site in Auckland, the very first permanent downhill ball rolling site was opened to the public on 8th March 1997 on the edge of Mt Ngongotaha, Rotorua (on the exact site OGO Rotorua now operates today.) And their first ball rolling customers? A group of 89 people in for a corporate team building function. Not bad for a first day! Zorb operated on this site for a year until the boys packed up and moved to a new location near the Agrodome. In 1999, Dwane exited the company to return to his career as a software engineer, while Andrew and Dave continued to operate Zorb Rotorua and introduced the Zorb to the rest of the world. Eventually, unhappy with the direction of the company after several corporate investors became involved, Andrew and David made the tough decision to sell and leave Zorb in April 2006. 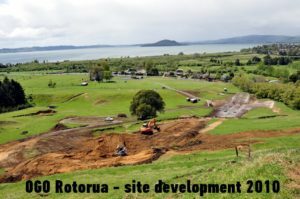 OGO Rotorua was created back on the original site where it all began on the edge of Mt Ngongotaha,. With Andrew and Dave at the helm, they have set about redesigning and developing the original site over the last couple of years – creating tracks, modifying designs and adding new features (no more cold trough water!!) The boys have now successfully created the largest downhill ball rolling park in the world at OGO Rotorua and (spoiler alert) we are about to get even bigger later this year!